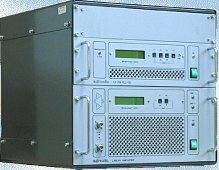 These packages below all include units which are in enclosures and putting transmitters in service basically means connecting cables, setting up an antenna etc. You do not have to assemble any electronic components etc. It is also recommended that you read the HOW TO START guide. This is a small, but well built and reliable broadcast worthy 300mW transmitter with mains power supply, coaxial cable and antenna; everything you need to start! You will enjoy excellent audio, stereo operation, a decent amount of output power for your property and excellent output filtering. Nicely built 19" rack with LED backlight will look good next to your audio equipment, too! Good audio quality, enough power for covering a small property or a house. Includes everything, even coaxial cable and antenna. Looks good in 19" rack and with backlighted LED display. It is never easy to predict range. Check this to get some idea. Basically depends a lot on your antenna location. It is a good idea to use PC as audio source and run some kind of audio processing software to form a cheap limiter/compressor (MLB4 or Winamp plugins, such as rocksteady). Save 5-10% off product price by promoting our website. Here's how. This is a small, but well built and reliable broadcast worthy 300mW DSP RDS FM transmitter with mains power supply, coaxial cable and antenna; everything you need to start! You will enjoy excellent audio, stereo operation, a decent amount of output power for your property and excellent output filtering. Nicely built 19" rack with LED backlight will look good next to your audio equipment, too! Excelent audio quality, enough power for covering a small property or a house. Includes everything, even coaxial cable and antenna. Looks good in 19" rack and with backlighted LED display with DSP options and RDS support. 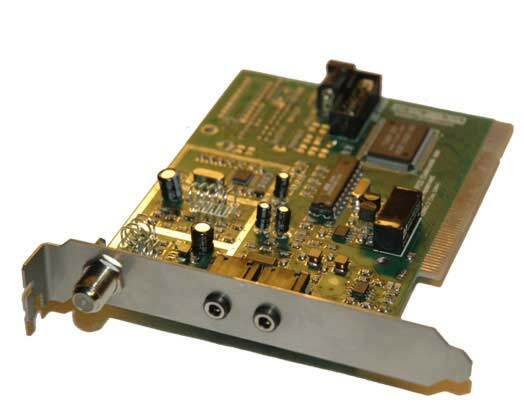 PCI MAX 2004 is a computer card that can change your PC into a fm radio station. This is the basis of this package. Note the blue connector for the LED display (only used in stand alone mode). Also, there is a blue trimmer close to the antenna connector. This is where you can set the power level, if necessary and if local laws allow it. This is perfect for playing music around your house and will change the way you listen to your MP3's or other audio (internet streaming etc) via PC. It will effectively change your PC into a FM radio station. You will be able to play your audio files (CD, wav, MP3, real audio etc.) from your PC through radio waves directly to your household radio receiver in the next room, in the living room, across your yard, in whole block of flats....or for the entire village/small city. You can either service your living room, garden or an entire community. It is probably the simplest way to start your radio station. Install this card into your PC as you would any other PC card. Install software and you're ready to broadcast! A standalone transmitter usually has a bit better signal-to-noise ratio since PC generates some noise and you can never get rid of it completely. - Coaxial cable (50 ohm coaxial cable RG213, RG58 or Belden-best), keep it short, you can get it HERE. - Antenna, we did not include it since you can build your own. Check our guides. You can also get COMET or MLB 6600 from our store. PCI MAX 2004 can also be used in stand alone mode! A small control unit with LED display can be connected via flat cable and enables changing the frequency and power via menu system. To purchase an antenna or coaxial cable check under accesories! This is our second most popular boxed unit, mostly due to higher price when compared to our midrange setup. It is definitely our best looking FM transmitter, its brushed aluminum rack enclosure and backlit green LCD display are real eye catchers. It offers up to 100% more range than the 5W transmitters. Another advantage when compared to other units is fully wideband operation and externally accesible power adjustment from 0 to 15W (20W max.). . Its hard to beat this package on features and price. - Output power: 15W (up to 20W max. ), adjustable from 0 to max via potentiometer! - Externally accesible power regulation, from 0 to max. - SWR meter to tune your antenna (optional) See this for full specifications. This is our second most popular boxed unit, mostly due to higher price when compared to our midrange setup. It is definitely our best looking FM transmitter, its brushed aluminum rack enclosure and backlit green LCD display are real eye catchers. It offers up to 200% more range than the 15W transmitters. Another advantage when compared to other units is fully wideband operation and externally accesible power adjustment from 80W to 150W. Its hard to beat this package on features and price. - Output power: 150W, adjustable from 80W to max via LCD menu system! It is never easy to predict range. Check this to get some idea. Basically depends a lot on your antenna location. More than 30Km can be accomplished with this setup with a good antenna on a high location. Of course solid coverage of 30Km with few dead spots requires more power, 300W, 1KW or more for excelent coverage with few dead spots. It is possible to use PC as an audio source and run some kind of audio playback/processing software, such as SAM 3, Jazzler or similar. This is our second most popular boxed unit, mostly due to higher price when compared to our midrange setup. It is definitely our best looking FM transmitter, its brushed aluminum rack enclosure and backlit green LCD display are real eye catchers. It offers up to 100% more range than the 150W transmitters and removes that dead spots where reception just wasn't solid before. Another advantage when compared to other units is fully wideband operation and externally accesible power adjustment from 200W to 300W. Its hard to beat this package on features and price. - Output power: 300W, adjustable from 200W to 300W via LCD menu system! The OMB-MP antenna is composed of two spiral-dipole elements which form a circularly polarized radiator. It is specially designed for individual use in low power Stereo FM broadcast applications. Its lightweight, sturdy construction makes it capable of withstanding the harshest environments. With stainless steel construction and high conductivity coating the antenna is virtually maintenance-free and well suited for extreme atmospheric conditions or salty environments. Its high-tech yet straight-forward design allows mounting to a mast or tower with extreme ease. Circularly polarized radiation is especially advisable in rugged terrain and/or large cities. It compensates well for the losses that arise from reflections and the resulting signal trajectories. This antenna offers its greatest efficiency in FM emissions that include Stereo, RDS, SCA, or Sub-carrier information. It is highly recommended for applications where vertical polarization alone is not desirable and particularly where home stereo, or fixed horizontal, reception antennas are a major factor. The OMB-MP antenna can be vertically stacked to achieve higher gain figures as shown in the chart above. Specify your operating frequency when ordering as each antenna is factory adjusted to 1.1:1 SWR at your frequency. Each element is DC grounded for additional protection against atmospheric discharges. The MP-1-.5 handles a maximum power of 500 watts. 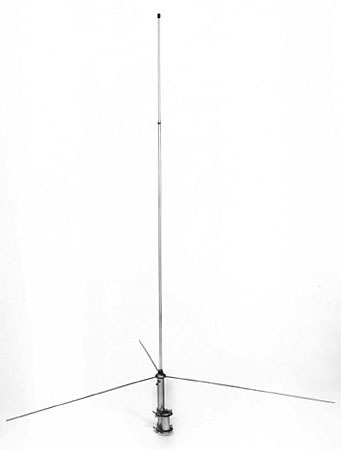 Two versions of the 4-bay MP antenna are available, the MP-4-.8K (pictured) handles up to 800 watts and the MP-4-2K handles up to 2 kilowatts. There is also an SGP-4 circularly polarized antenna available which handles up to 10 kilowatts. A convenient aspect of this antenna is that you can add bays even after you have purchased the antenna, i.e. you can upgrade an MP-2 to an MP-4, etc. (email for pricing). It is never easy to predict range. Check this to get some idea. Basically depends a lot on your antenna location. More than 30Km can be accomplished with this setup with a good antenna on a high location. Of course solid coverage of 30Km with few dead spots requires more power, 1KW or more for excelent coverage with few dead spots. PROFESSIONAL SERIES OF CERTIFIED FM TRANSMITTERS from Elektronica! We bring you the new line of professional certified FM transmitters from an internationally established manufacturer. This unit is a rack package/combination of a 30W exciter and 1000W amplifier. It is never easy to predict range. Check this to get some idea. Basically depends a lot on your antenna location. More than 30Km can be accomplished with this setup with a good antenna on a high location. These units below are suitable for price-concious students and hobbists who know how to solder and are looking either for fun while putting every small bit together or they want to save a few dollars. You don't have to purchase one if you ordered one of the Stereo models in an enslocure. Stereo encoder enables stereo signal and can be hooked up to MAX PRO I & MAX PRO II. We recommend you to add LIMBO I, which Iincludes audio limiter, compressor and audio low pass filters at 15KHz. This is really up to your budget and plans. Generally you will need a mixer sooner or later so you can mix and control various audio sources (microphone, CD, DAT, cassete deck). Read more about audio equipment here.